ConextTM SW-NA is perfect for off-grid, backup power and self-consumption applications, it’s a pure sine wave, hybrid inverter system with switchable 50/60 Hz frequencies, providing power for every need. Conext SW-NA features 120/240 VAC output, and capable of producing 120/240 VAC output from a 120 VAC input, without the need for an external transformer. For expanded off-grid capacity, the Conext SW-NA is integrated with fuel-based generators as required to support loads larger than the generator’s output. It’s also self consumption ready, able to prioritize solar consumption over the grid, while maintaining zero grid export. 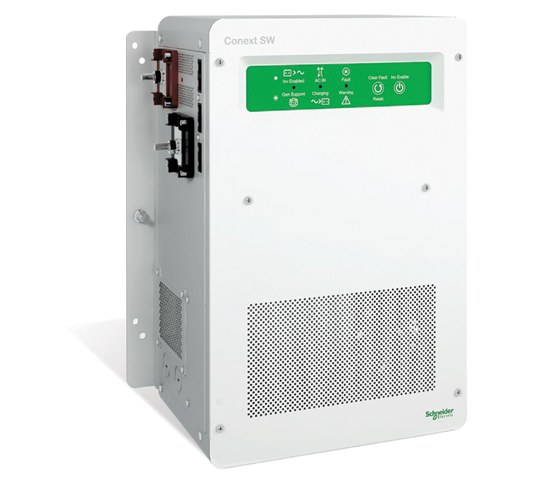 The Conext SW-NA works with the grid to avoid peak utility charges and support the grid when utility supply is limited. Stacking two Conext SW-NA units will double the system’s total output power and available solar charge controllers allow for the integration of solar capacity as required. Note: 48 V model available in 2015!